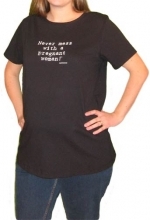 Never Mess With a Pregnant Woman Discounts Apply ! It’s said, “All true wisdom is found on t-shirts”. That has probably never been truer than in the case of this t-shirt. It not only acts as a “public service announcement” but is also the perfect baby shower or Christmas gift for the expecting mom on your list this holiday season.